(Cambridge, MA) I’m not sure if I can really describe what I just saw onstage at the A.R.T. I guess I could start with… an earthquake; birds, snakes, airplanes… Lenny Bruce is not afraid. 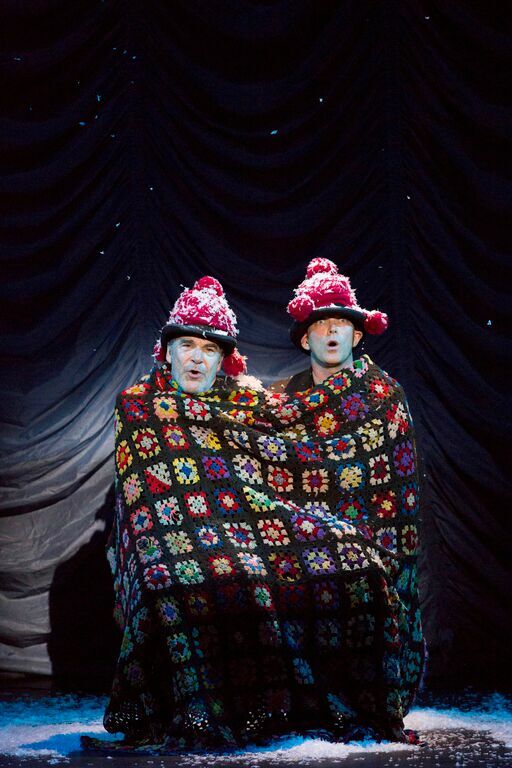 Mandy Patinkin and Taylor Mac play the last living survivors of the human race after a “flood of biblical proportions” has wiped out everyone else in The Last Two People on Earth (an Apocalyptic Vaudeville). Together, the duo take on the pastiche of familiar vaudeville tropes: a two-man musical comedy act complete with bowler hats, tail coats, hooked canes, buckets of water, and (of course) cream pies to the face. Though the A.R.T. website tells me that the show is a tale of human contact and interaction through song depicting hope lost then found again, to be honest I had a difficult time following these themes as I sat in the Loeb drama center. Without a doubt, Patinkin is a world-class performer and Mac matches (if not exceeds) his energy and verve at every turn. There was nothing lacking in the performance of this piece. It is simply thrilling to hear Patinkin sing live and this show’s rampant physical comedy certainly hit its mark (literally). That said, there was little to no story that I could find in the mish-mosh of songs that make up this musical review. The songs flow like water or perhaps like a half-forgotten memory; threads intertwine and connect from number to number and develop a rambling half-told narrative as the dynamic duo croon and hoof their way through everything from Sondheim to R.E.M. The one-set production pays homage to its Vaudeville namesake with an internal proscenium, footlights, and a dual-spot curtain warmer. Scenic designer Beowulf Boritt not only has the coolest name on the Boston theatre scene, but also an unparalleled attention to detail. Costumes by William Ivey Long and Sound by Daniel J. Gerhard also worked to set the mood and show us an apocalypse now. Ken Billington’s lighting design almost seamlessly melded with the set to create time, place, and definite space to what might otherwise be a wandering, otherworldly, and unfocused piece. On the whole, the production was well put together and visually remarkable despite its seeming simplicity. As far as the content of this world-premier show goes, it’s tough to see Broadway in its future. I mean don’t get me wrong; never in my life did I think I would bear witness to Mandy Patinkin wearing a terrible Christmas hat wrapped in a vibrant hand-crocheted blankie and covered in fake snow belting the harmonies to “Fairy Tale of New York” while playing the musical spoons (…you can’t make this stuff up). But was that moment worth the evening? For me, yes, but I might be in the minority on this one. The show is borne up by the strength of its performers; without them, it would crumble to dust beneath a tidal wave of unconnected material. If you’re looking to see Mandy Patinkin live onstage, you’ll find that at the A.R.T. If you’re looking for a cohesive narrative or an evening that you can make sense of, you’ll probably have to keep searching. After all, there are plenty of fish in the floodwaters. This entry was posted in Musical Review, Musicals and Opera, Uncategorized and tagged 2015, American Repertory Theatre, art, “Fairy Tale of New York”, Beowulf Boritt, Cambridge, Daniel J. Gerhard, Danielle Rosvally, Ken Billington, Loeb Drama Center, MA, Mandy Patinkin, musical spoons, Paul Ford, R.E.M., Sondheim, Susan Stroman, Taylor Mac, The Last Two People on Earth: An Apocalyptic Vaudeville, vaudeville, William Ivey Long by Danielle Rosvally. Bookmark the permalink.